Watch the horizon from the Clone Commander’s command station! Use his electrobinoculars to spot 2 droidekas advancing on their position. Help the Clone Trooper repel the rolling Droids with a hidden flick missile before they come within range! Recreate epic battles from Star Wars: Episode II Attack of the Clones. Includes 2 minifigures with assorted weapons and an accessory: Clone Commander and Clone Trooper…. 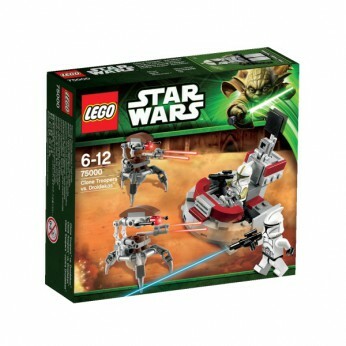 This toy costs approximately £11.99 (for the latest and best prices make sure you check our retailer list for the LEGO Clone Troopers vs Droidekas 75000 above). In our review of LEGO Clone Troopers vs Droidekas 75000 we classed it as being suitable for ages 6 years, 7 years, 8 years but recommend you check the manufacturer specific advice before purchasing.